Almost three months after the historic 2018 midterm elections when Democrats triumphantly took back control of the US House, the country is still awaits the outcome of one lone election - North Carolina's Ninth Congressional District. The traditionally "red" district has been Republican for the last 50 years, and by incumbent Republican Robert Pittenger since 2013. Pittinger, however, was unseated in the May 8, 2018 Republican primary by Baptist Minister Mark Harris, who had narrowly lost to him in the 2016 primary. In the 2018 general election Harris was pitted against Democratic nominee Dan McCready, a former Marine Corps Captain, Harvard Business School graduate and founder of a solar farm company in Charlotte. Although McCready conceded the day after the election, the state Democratic Party filed affidavits with the state's Board of Elections alleging Harris had used independent contractors to fraudulantly collect absentee ballots from voters. Coming out of the November 6, 2018 midterm election, Harris led McCready 49.3% to 48.9% -- a 905 vote margin. No winner has been declared, however, as certification is on hold pending an investigation into absentee ballot fraud. The allegations involve voting irregularities took place in Bladen and Robeson counties, and actions by a Harris political consultant McCrae Dowless, who had been hired to oversee absentee ballot operations in the county. 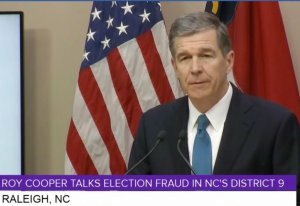 Witnesses have said Dowless, who had a record of felony fraud and perjury convictions, paid them to pick up mail-in ballots, a felony under North Carolina law due to tampering concerns. The Bladen County Board of Elections has accused the chief investigator for the North Carolina Board of Elections of taking absentee by mail ballot request forms and their return envelopes from Bladen County immediately after the Nov. 6 election. In Robeson County, the easternmost county in the 9th district, twice as many absentee ballots from African American voters were not returned compared to white voters. Wake County District Attorney Lorrin Freeman said it was possible over 1,000 ballots had been destroyed. 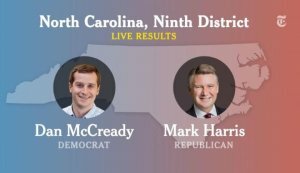 November 27, 2018: The North Carolina State Board of Elections, which is comprised of four Democrats, four Republicans, and one independent member, voted unanimously not to certify the results in the 9th Congressional District. November 30, 2018: The North Carolina State Board of Elections reconvened and voted, 7-2, for an evidentiary hearing on the irregularities. Originally scheduled for December 21, 2018, it was postponed to January 11, 2019. December 28, 2018: A three-judge state panel dissolved the North Carolina State Board of Elections, following a legal battle over its original composition, and its authority in making changes to the state's elections administration system. A prior decision had ruled the board unconstitutional, but gave the board a temporary reprieve till December 28th to complete the ballot fraud investigation, or be dissolved. January 2, 2019: The evidentiary hearing scheduled for January 11, 2019, was postponed because there was no board in place to subpoena witnesses or hold hearings. January 3, 2019: Mark Harris was not sworn in to the 116th Congress. Under the US Constitution, the House is the judge of the elections of its members and the final arbiter of contests. House Democrats, who are in the majority, said they are waiting on results of the investigation before seating a new member. The last time a chamber of Congress delayed or rejected seating a new member was in 2009, when Senate leaders initially refused to seat Roland Burris as the interim replacement for President-elect Barack Obama's Illinois Senate seat. Burris had been named to succeed Obama by Governor Rod Blagojevich, who was eventually convicted on corruption charges. Burris was sworn in 9 days late. January 31, 2019: Governor Roy Cooper (D) appointed a new five-member state Board of Elections, which set hearing in the 9th District investigation for February 18th @10am. February 18, 2019: In the 2-3 day hearing, the board is expected to vote on whether to certify the election or call for a new one. In the interim, a Wake County Superior Court Judge denied Harris' request to certify the election results while the investigation was pending, and the McCready campaign announced it has raised $500,000+ for a possible new election.